Dale Haskell was diagnosed with ampullary pancreatic cancer in December 1996, at the age of 46. The tumor was 1.5 – 2.0 cm and grew over the ampullary duct area (the place where the combined bile duct and pancreatic duct meets the small bowel). He underwent the Whipple procedure in January 1997. Chemo was 5FU with radiation. Care was received at the University of Florida’s Shands Cancer Center. His surgeon was Dr. Steve Vogel; his oncologist was Dr. Robert Marsh. Dale’s primary caregiver, his wife Karen Haskell, also contributed to this story. Dale and Karen live in the Gainesville, Florida area. At the time of diagnosis, they had been married 2 years and Karen, previously a widow, had adult children. Concurrently with Dale’s medical treatment, Karen was also a part-time caregiver for her mother, a Parkinson’s disease sufferer who in August of 1997 came to live with them. Both were originally from New England, but met in Florida through their church. Their faith in Jesus Christ has been the cornerstone of their lives together, as well as of their journey with this disease. Karen is on the administrative staff of the City of Gainesville. 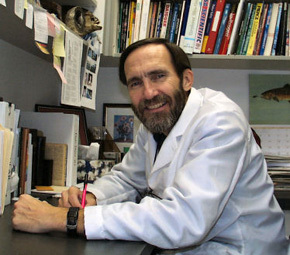 Dale is a senior biologist at the University of Florida. Realizing a lifelong dream, they’ve since moved to a nearby lake community near some of their children and grandchildren. Dale is also a survivor of kidney cancer, basal cell skin cancer, and a prostate scare (50 biopsies, but no malignancy) found. None of these appears to be related to this particular illness. During the spring and summer of 1996, Dale “had two episodes of pain in the middle of my back a few months apart. The pain from the second was so intense, it had me down on all fours.” A sonogram identified a dilated pancreatic duct, and a subsequent CT scan showed no immediate signs of a tumor. But with four other pancreatic cancer patients, Dale’s gastroenterologist, Dr. Stavros Diavolitsis, wanted to treat him aggressively. So he scheduled an ERCP – the x-ray/endoscopic procedure commonly used to investigate problems in the pancreas and related areas. “Thanksgiving week, the night before the scheduled ERCP, I woke up with fever, chills, and vomiting. The next day, upon hearing of this, my gastroenterologist postponed the procedure. On Thanksgiving Day I could barely eat at all. By Friday my urine was brown and my stools were white and I was jaundiced. I went to the ER and was admitted. Finally, the planned endoscopy occurred, revealing a tumor that had blocked the ampullary duct. A stent was inserted, and a biopsy ultimately diagnosed malignant adenocarcinoma. Looking back then, Karen realized he had been losing weight – about 25 pounds. But since he had gained 30 pounds since they’d been married, she’d thought he was heading back in a good direction. Gainesville, home of the University of Florida, is a huge medical community with an abundance of superior health care facilities and professionals. And Steve Vogel, Dale’s surgeon, is a highly regarded Whipple practitioner. His surgery was scheduled for January 7, 1997, a Monday. On the Friday before, Dale was admitted early, due to a bout of pancreatitis. Dale flipped back into research mode, familiar territory. He consulted various experts and reviewed several studies, all supporting the hospital’s original recommendation. Armed with the extra confidence, Dale decided to proceed with the recommended treatment, consisting of a bookended three days of 5-FU, surrounding 25 days of radiation. Treatment is a surreal time in some ways. For those going through the experience, ironies abound. In the (intense but) award-winning play and film “Wit”, about a cancer patient, the protagonist has considerable time on her hands to contemplate such things. At one point, temporarily relegated to a germ-free section of the hospital, she observes: Curious. I am not in isolation because I have cancer. I am in isolation because I’m being treated for cancer. My treatment imperils my health. Herein lies the paradox. When discharged, Dale recalls being given prescriptions for gas, for pain, and to avoid ulcers. A J-tube that had been inserted during surgery allowed direct injection of liquid nourishment into his stomach, especially during radiation/chemotherapy when he didn’t have much of an appetite. Except for that, and problems with gas largely gone now, Dale experienced very few of the digestive issues common after Whipple surgery. “To this day, Dale eats like a horse,” says Karen. “My cross to bear is that forever, I am maybe the only wife I know destined to weigh more than her husband.” He takes only pancreatic enzymes (Creon), Vitamin B-12, and an ulcer-preventative (Zantac). “My fear – that I could never eat pepperoni pizza again – never materialized.” He does make his own pizzas, though, precooking/blotting the sausage slices. So now, the new Big Question. Is this the pancreatic cancer, metastasized? Or is it a new primary tumor? Six weeks stretched out before them, until the next operation would give the answer. To Karen, it felt like six years. “Interestingly, Dale had a sort of cone of peace over him. But unbeknownst to him, I didn’t have that. My faith was severely tested during that time.” The system had let her down. They were supposed to have been watching Dale like a hawk. If anything happened, they’d be right on it. But it didn’t work that way. How could this happen? Medical – Dr. Vogel, Dale’s surgeon, had to deal with lots of Murphy’s Law situations during the post-surgery period. A good shared sense of humor helped Dr. Vogel and his patient have a continued relationship of both fun and respect, and went a long way toward his successful recovery. The Association of Cancer Online Resources (ACOR)– a national volunteer-led non-profit organization linking cancer patients and their families and caregivers with information, support and community. Their pancreatic cancer listserv group is one of the most active and supportive online. Interested readers may join here. “In hindsight, I was providentially prepared for this experience by have just gone through a video series at church.” Partially recorded at M.D. Anderson, it was entitled Surprised by Suffering. The book, True Spirituality by Francis Schaeffer, “emphasized giving thanks that God is somehow using my illness for good purposes”. The Haskells were fortunate to have friends who were doctors, to help answer certain questions and develop lists of others. “The surgeon, you only see briefly. How are we to make sense of things? Malignant. Even from the beginning, we would have been paralyzed with that word, if not armed with facts, and new questions to get more.” If you don’t have such a resource, see if you can talk to your primary care physician in that way. What kind of questions would they ask? Author and “terminal” cancer survivor Vickie Girard says someone once reminded her: “’Our life comes to an end when God comes to the end of our rope, not when we do.’ Sometimes the best we can do when we get to the end of our rope … is to tie a knot and hang on.” Dale and Karen have hung on magnificently, and God is thankfully not at the end of their rope yet. Now, their testimony bears witness and gives comfort to countless others. As told to Ian MacBean and assisted by Alison Wiley, an oral historian working with people and organizations to recall and record their important stories.